I stood bemused. Although, can one consider it standing if one is travelling sixty kilometres per hour in a northbound direction? I made a mental note to ask Ypres. Getting back to my predicament, the reason of my bemusement was the unappealing menu poster I was facing in the Amtrak train bound for Montreal. It was pealing at the corners, and each item was immortalised in its own photograph. The photographs suggested that the items had been in their prime during the Carter presidency. Ypres and I had left Manhattan in rather a hurry, dragging a wounded, yet groaning, Michael Beaconsfield-Outremont with us. Ypres had decided that, as we had to leave New York to receive payment of Madame LaPeine de Mort’s generous gift, and Beaconsfield-Outremont could not afford medical care in the United States after having been run over on Park Avenue, we should drop off the mangled Montrealer in his home town before heading back to London. The train was the best option, as it was discreet, and Beaconsfield-Outremont could lie down to rest on my luggage, which got its own row of seats, quietly groaning his way up the Hudson Valley. In our haste, we had forgotten to take adequate provisions. So here I was in the restaurant car, Lake Champlain rolling by, a distant rail attendant staring at me with the utmost emptiness, as I decided which of the items I could ingest without triggering an immediate heart attack. I was nearing a selection which would not precipitate a triple bypass surgery. With a confidence born out of desperation, I was about to risk ordering something covered in cheese by way of the deep fryer, when I was the recipient of a friendly tap on my left shoulder. Nowhere had Cousin Andrew looked so out of place and been so welcome. Pushing aside Britannic reserve, I hugged him tightly. “Well, the thing is,” here Cousin Andrew leaned in as would a bartender offering a suggestion, “there is this area in Montreal by a canal called Saint-Henri, which is not as mainstream and ruined by consumerism as Shoreditch or Williamsburg. My initial thought was the Plateau, but I’ve been told it’s full of Parisians and Belgians – and I’m looking for the true Montreal.” Cousin Andrew had finished his phrase with the glint in his eye of the weeping hipster soldier, who has discovered that there are, indeed, more worlds to conquer. Recovering his poise, Cousin Andrew pointed vaguely in my direction. I gave Cousin Andrew the rundown of events as they had happened since we parted, being sure to include every outfit change, and providing the appropriate rendering of stage directions. With each expertly delivered paragraph, we got closer and closer to the embrace of the Canadian border. For once, Cousin Andrew did not yawn or interrupt me. This confirmed my standing as an unparalleled raconteuse. I had reached the final Park Avenue scene of selfless heroism and international diplomacy, when I unconsciously slid into a dramatic monologue. “Elysium,” came the stoic reply from behind me. It was Ypres. She had silently glided in. And no better moment encapsulated this adventure. Ypres and I had crossed the Atlantic to reach our American Elysium, and although our victory was unconventional, I was assured that no matter the circumstances, Ypres was steadfastly by my side. Life would throw suited bankers, telephoning uncles, hipster cousins, unimaginative self-centred diplomats, singing nieces, nationalistic aunt, and groaning muscular Canadians, but through it all a calm aquatic presence remained. As the train slowed down for border inspection, the reassuring presence of the Commonwealth nearby, there was but one word to end our American adventure. Vasa and Ypres’s first full-length adventure, Vasa and Ypres: A Mayfair Conundrum, is available on Amazon. If you enjoy Vasa and Ypres, please share on social media. Vasa and Ypres is on Twitter. You can also join over 1960 WordPress followers. 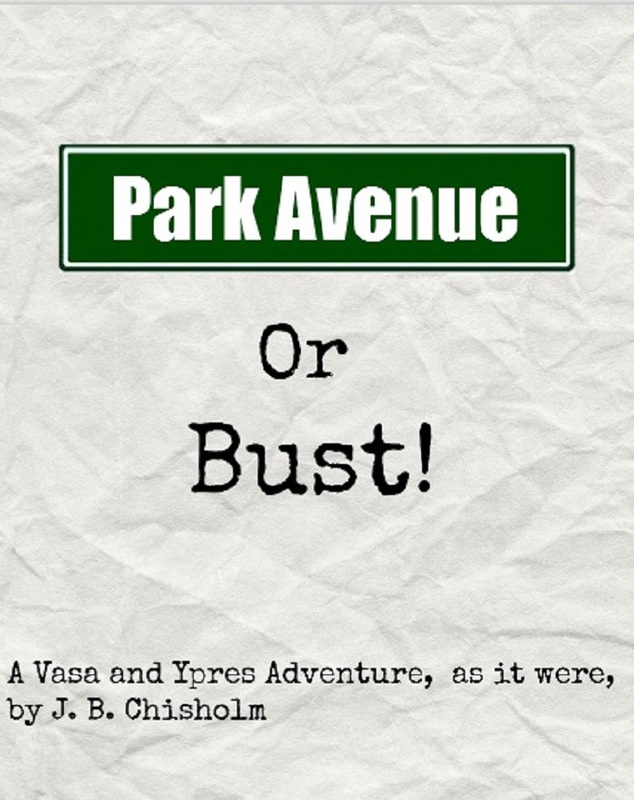 Next Post Vasa and Ypres’s Latest Book: Park Avenue or Bust! I didn’t want this to end. I even delayed reading it for over a week. But now its done. So, when does the next one start? I too, did not want it to end, so I delayed writing the last chapter. The next step is getting Park Avenue or Bust published in book format. But, I can assure you that there will be a new Vasa and Ypres adventure after that. In this place, women call the shots as often as men do, and the suffer the slings and arrows of outraged critics – or earn their huzzahs. Can’t wait for it all to be compiled and available on Kindle! Fantastic work like always, J.B.!